Leaving Thailand, only one month and two countries were left on our route: Laos and Vietnam. 50 years ago heavily bombed by the US during the Vietnam War, today the two countries are at a very different level globally. Laos, at two thirds of Vietnam’s size, houses 6 million people and is one of the poorest countries in South East Asia. Vietnam on the other hand, with a population of almost 93 million has a booming economy and is developing at a rapid rate. During our last month, we marvelled at the stunning Laotian nature, got a lot better at scooter driving in Da Nang and organised a beautiful ending exhibition to our journey. Arriving in Vientiane, Laos’ capital, the crew was reunited at last, although just for a very short time. Because on the next day, Nina and Elena went ahead to fly back to India. With Rupa also needing to go earlier towards Luang Prabang due to her visa duration, the team was now back to the very beginnings with iA and Yannic. During the course of the project, we had often discussed what the perfect size for the team would be. A bigger group of course meant to have more variety and different ideas, but at the same time it also took longer time to find compromises for the way of the project. In a smaller group decisions would be far easier, but then again the workload would be much higher and the variety in available skills would diminish. So now that we were down to just two members, we discussed if we wanted to invite more members but decided to see how our two person, founder/co-founder system would be like. In the next weeks, our workload rose significantly, but the project seemed a lot more clear. In the incredibly calm capital with its wide streets, we stayed in our host Noi’s large house and first of all got to know the city and used the slow down in pace to plan for the remaining month of our travels. We found out that Laos seemed to be quite a bit more expensive than Thailand or Myanmar and that the food was not as spicy and often soup-based. In Vientiane, we met up with the Gender Development Association (GDA), an organisation battling gender roles and violence against women through workshops. Apart from them, Laos didn’t offer us too many interview opportunities though. We wanted to conduct an interview with the Lao Women’s Union, but we were blocked by a required authorisation from the foreign ministry. On top of this, we also wanted to concentrate on how to finish the project in Vietnam and how to continue after that and so our interview with GDA would be the last one during our route. After being sick for a while, we decided to take a bus to Luang Prabang, the former capital. This proved to be a terrible decision. With the AC not working and a constant smell of fuel in the bus, it finally broke down and so we decided to hitchhike the second half of the way. This was the best decision of the day. 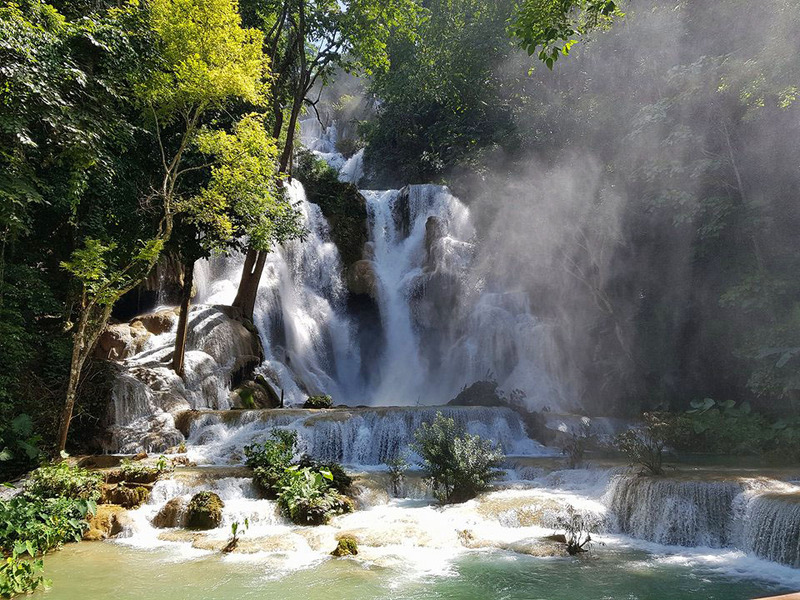 Driving through the curvy roads on the back of a pick-up truck, we got a glimpse of Laos’ stunning landscape – vast jungle, steep hills and very few people. Luang Prabang, as Laos’ main tourist destination, didn’t offer much of interest for our project but here we met up once again with Rupa and had great talks about her school project in Bangladesh and how it was for her to work in Thailand with the UNHCR. Together with her, we visited stunning waterfalls and ate our way through delicious vegetarian buffets. Finally, we decided to hitchhike back to Vientiane together – this time we were not as lucky though and gave up after three hours of waiting at the side of the road. Back with Noi in Vientiane (after a sad goodbye to our last group member), we decided that it would be too stressful to still go to the South of the country and decided to directly head to Vietnam in order to organize a worthy finishing event instead. We took the 16-hour bus ride directly to Da Nang, in the center of Vietnam and the last station on our route. In Da Nang, we were welcomed by our lovely and incredibly talented host Tano and soon started scouting for locations for our event. Although many people offered us to use their location, it was quite hard to chose one as it was important for us to not be commercially motivated but we at the same time still needed a suitable and central location. We received a lot of help from couchsurfers for this and one of Tano’s friends helped us immensely to understand the government licensing better. Staying in Da Nang, we explored the Vietnamese food together with Tano and quickly fell in love with Pho, the traditional Vietnamese noodle soup, and a spicy-sweet Vietnamese sauce. Tano explained that this sauce was the reason why the many Korean tourists loved the Vietnamese food so much as it’s very similar to the Korean Gochujang paste. After Laos, Vietnam was a lot more busy with scooters overtaking each other everywhere. We also rented one and enjoyed diving into the lively traffic. Da Nang itself was very modern and seemed well planned, but later we heard that just 20 years ago, there used to be just one bridge in Da Nang which still stemmed from the war. Today, there are five of them, all very modern. Wherever we looked, Vietnam’s economic boom is incredible – over the last 10 years, the country’s GDP has nearly tripled. Da Nang itself grew into a metropolis during the war, when it was home to a massive American airbase. From a population of fifty thousand in 1955 it rose to nearly a million as of now. We were surprised that every person we spoke to told us that there were no bad feelings towards the US for the war. This might have to do with Vietnam winning the war and with Da Nang not suffering as much from the war as for example Hanoi or other cities in the North due to its status as an American base. On the other hand, American cultural imperialism has also found its way to Vietnam as it has found its way to almost everywhere in the world and so American influence has probably determined the country’s reputation. Finally, it was time for the finishing event of our journey. iA had created thought-provoking paintings to highlight and critisize gender roles which we exhibited together with pictures from our trip. We were very nervous before the event as it had been organised within such a short time frame that we almost had no time to advertise it properly. In the end many people came though and except for some laptop and beamer problems, we had a beautiful last evening of our journey. We presented our project, introduced the paintings and watched Jo’s short documentary about us. Almost everyone who showed up for the event, gave us a donation for the paintings and photos, but most importantly, we were connected! We had great talks about our project, feminism, refugee situations or racism in general and became friends. It was inspiring to see that we build something up that people were interested in – in a very short time, in a completely new country. Although we didn’t experience Laos and Vietnam to the same extent as the other countries on our route, they still left a very personal feeling in us, mainly thanks to our lovely hosts Noi and Tano and because the near ending of our long journey. Vietnam and Laos, as similar as they are in their culture, proved to be very different nowadays due to their difference in economic growth and population density. Where we felt Laos, together with Myanmar, to be the calmest country so far on our route, Vietnam’s cities are bustling metropolis that develop incredibly fast. After more than a year on the road, we finally had reached our aim in Vietnam’s Pacific coast. The last month of our journey was a busy one, but incredibly rewarding with the ending exhibition. Almost 28.000km of hitchhiking after setting off in Germany, we had completed the route we had set out to explore. On the way, we’ve learned so much from the organisations we met as well as from the personal interactions within the group and with people we met along the way. 18 members of Spicyroad have since determined what the project is about and made it what it is today. Now, we need to look further and decide how we want to continue. Thinking about how we’ve developed on this journey so far, we’re looking forward to the next steps!